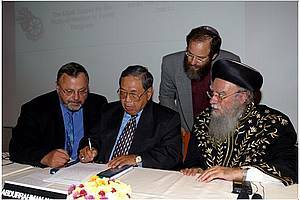 The Elijah Interfaith Institute joins the many people worldwide who mourn the death, on Dec. 30, 2009, of former Indonesian President Abdurrahman Wahid, affectionately known as Gus Dur. Gus Dur was a founding member of the Elijah Board of World Religious Leaders. As the Muslim member of the founding presidium, he provided support and initiative by inviting other Muslim leaders to join the vision of the Elijah Academy and Board of World Religious Leaders. President Wahid was the first democratically elected president of the largest Muslim country in the world. He was renowned for his wisdom and deep commitment to dialogue among the religions of the world, and being one of the intellectual/spiritual Fathers of Indonesia’s Liberal Islam Movement. Even after his presidency, Gus Dur nevertheless continued to wield – and will continue to wield – positive influence through the political party he founded, the National Awakening Party (PBK), and even more as a nationally and internationally revered intellectual and spiritual leader of Modern Islam. In addition to his role in founding the Elijah Board of World Religious Leaders, President Wahid took part in various events organized and co-sponsored by Elijah. In 2003 he was with us at the Paris UNESCO Buddhist-Muslim dialogue, organized with the Museum of World Religions. His analysis brought to the fore the importance of local cultural factors in shaping the many faces of Islam worldwide. Wahid continually expressed concern that the local cultural dimension of Islam not be erased, despite the political forces that seek to reshape and redefine contemporary Islam, against centuries old local traditions. Foundation on the theme “Combating Terrorism”. The statement from that meeting remains as relevant as when first released. It is copied below as a tribute to Wahid’s courage and memory. President Wahid’s influence will live long after his death through his political party and through the Foundation that bears his name. His personal example, the extraordinary model of a Modern Muslim who embraced the best of Modernity, with interreligious dialogue at its center, and combined it with the deeply spiritual Sufi Tradition of Islam, will provide continued inspiration to those who work for peace and understanding, Muslims and non-Muslims alike. 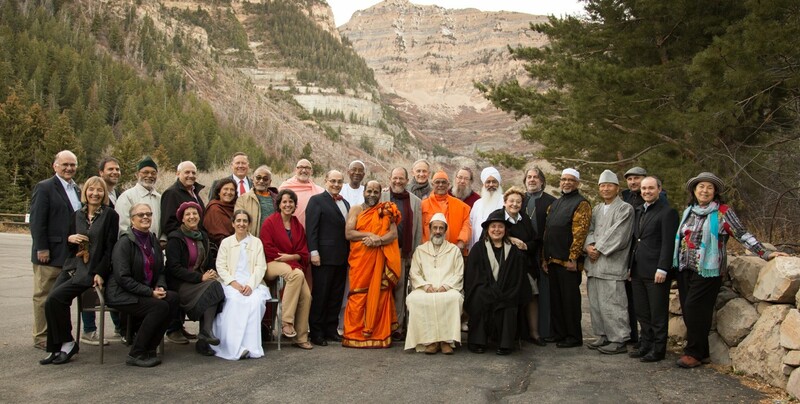 We the undersigned, religious leaders who believe in a creator God, guide of the universe, firmly express our conviction that our religious traditions categorically oppose the use of terrorism. Terrorism is an abomination in the eyes of God and opposed to a proper understanding of our respective scriptures. It is also opposed to every principle of humanitarian concern. In all our religions God is affirmed as merciful and compassionate and calls on us to be compassionate and merciful accordingly. Causing suffering in God’s name is opposed to the will of God. We affirm the highest religious value to be the sanctity of human life. We condemn those expressions of our religions that speak in the name of our religions and that endorse the use of terrorist means, such as suicide homicides, to achieve political or other goals. While we recognize the value of deep belief in our faiths, to the point of offering our lives for them, this must never be confused with harming innocents in the name of a cause. We also believe that one of the consequence of terrorism is the creation of immense suffering not only for the victims of terror, but also for those who seek to benefit from it, or through it. We encourage religious leaders of all traditions to firmly express their religious conviction against terrorism, thereby helping to purify our religions from a contemporary cancerous growth that threatens to destroy our human face.